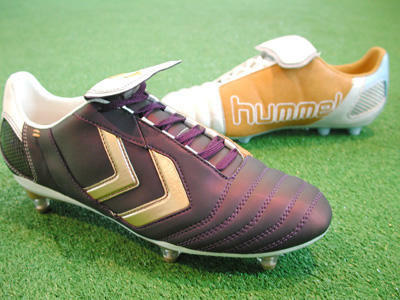 The new 2005 hummel Indoor Collection has just finally (after 1 long year of development) arrived at retail. 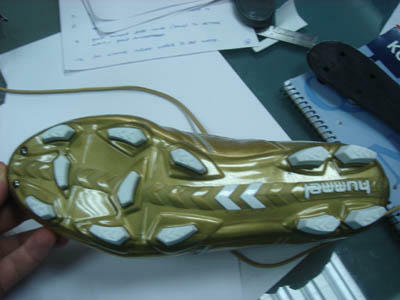 Here are some pics of the final shoes, and few pics of some first development prototypes. 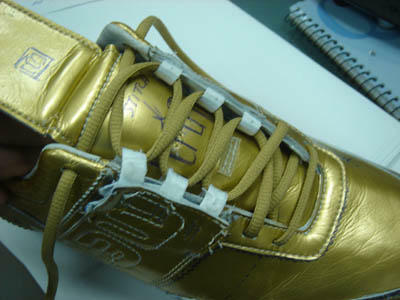 More exclusive pics of the development process and other models to be posted later this week and in the near future. 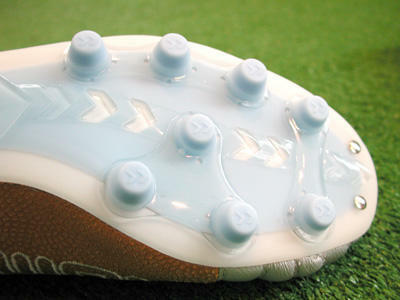 The above model is the 7.1 (women's colorway shown). Designed specifically for Handball, the 7.1 features an innovative half-double-lasted outsole construction with a dual part CM EVA midsole for cushioning and control. 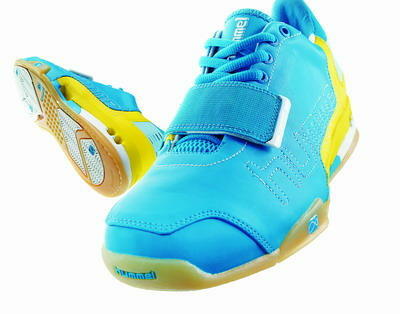 The upper features a large elastic forefoot velcro strap and inner sock fit for ultimate comfort and fit. Some of the first colorway sample prototypes of the 7.1 and 8.1 styles. 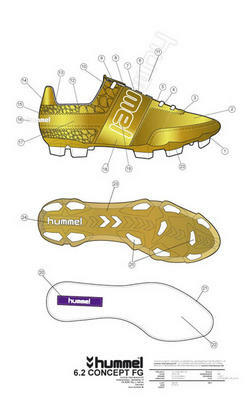 Check out www.hummel-indoor.dk for more about the final collection and concept. Special thanks to Manolo at www.shoeblogs.com for a link to first pullover. 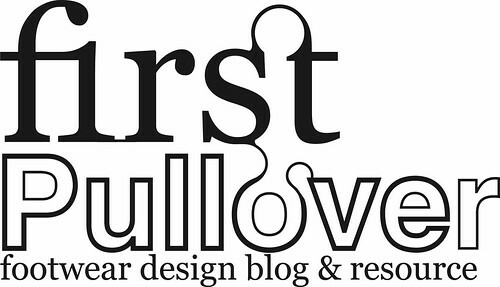 Check out the site for a daily update of great fashion and shoe info! 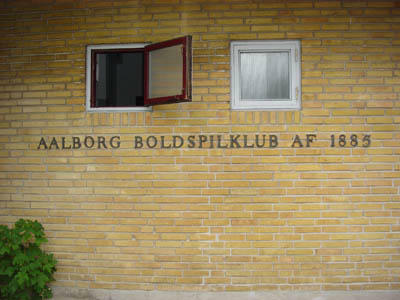 On the way to the Dana Cup yesterday we stopped in at Aalborg Football Club, a Superliga team sponsored by hummel. As a part of our ongoing relationship with this club (in addition to being a footwear and kit supplier) we often use these professional players to weartest our new boots and consult during the design and development process. Click Read More below for more pics and info. 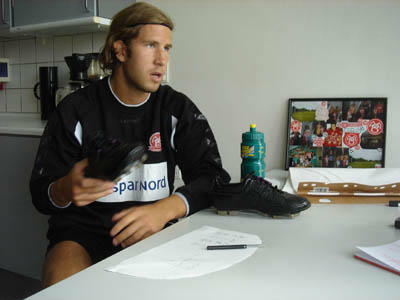 Yesterday, we interviewed 2 AaB players, 7 Mattias Lindström, and 18 Martin Ericsson. Lindström is currently testing the 6.2 Concept FG, and Ericsson is testing the 4.2 Concept FGC. 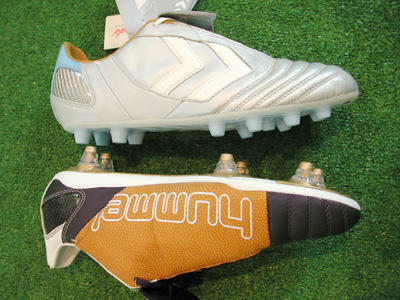 Both are using the boots daily in training and matches. 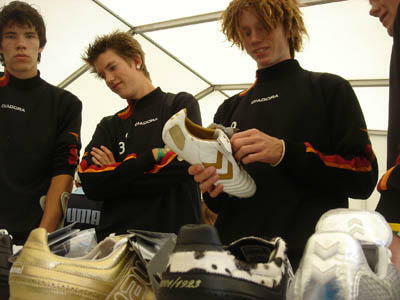 On the right, in the photo, you will see our Development Manager, Michael Pao discussing the boots with the players. Michael has also been a pro football player for 6 years, playing in Japan, Netherlands, and Indonesia. As promised some pics at the Dana Cup. 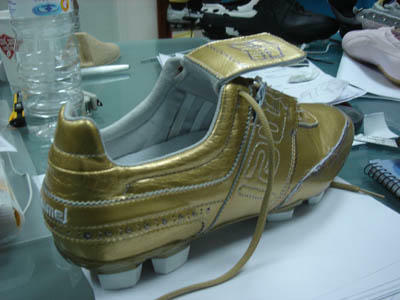 Overall, the reaction to our preview of the new 2006 boots was amazing. 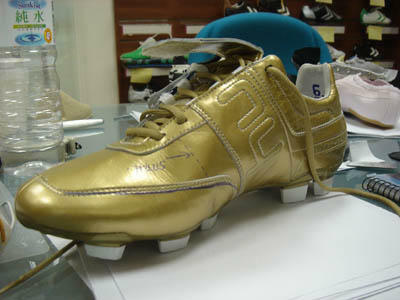 The new styles, especialyl the Gold 6.2 Concept FG really captured the attention of many of the young players, with the only disappointment being that the boots were not available until next Jan/Feb! Click the Read More link below for more pics. 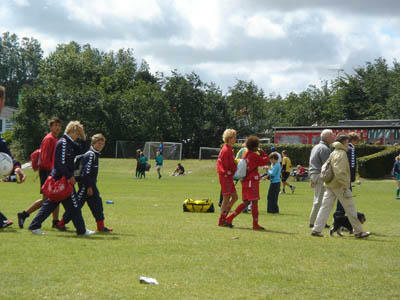 I went to the Dana Cup youth football tournament today in Hjørring, North Jylland, Denmark. 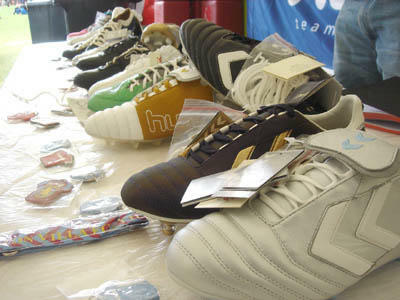 A world class football tournament with more than 800 teams and players from almost 100 countries. 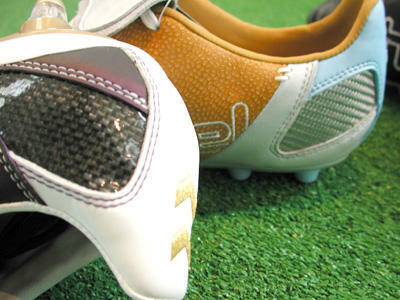 We previewed some of the new Football 2006 boots and had the opportunity to discuss new ideas with some great young players. Photos and more info to come tomorrow. Finally, the 6.2 Concept FG is taking shape! 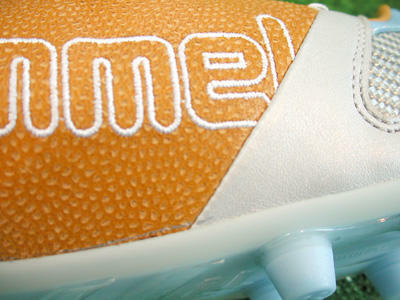 Following the specifications and pattern corrections, the first colorway samples are made giving a first look at the future of this new boot. Click the Read More link below for lots more pics and description of the revisions and technical changes made to the first colorway samples. Overall, the first samples look very good. 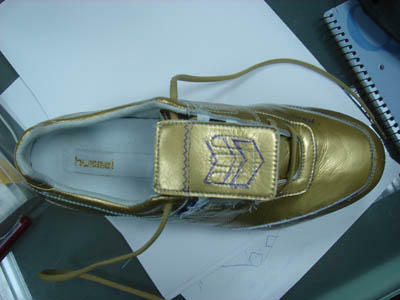 The gold SuperMicrofibre material with the croc emboss looks really amazing, and the new pattern needs only some small adjustment. 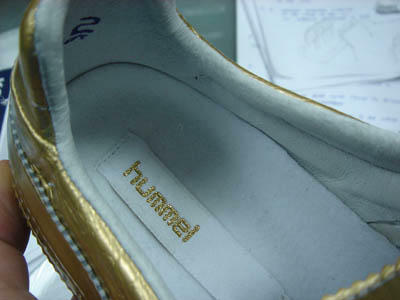 The toecap pattern is adjusted to better follow the last shape, and the tongue pattern is adjusted to add a perf chevron logo on the flipover tongue, moving the "M" of the hummel word onto the tongue. 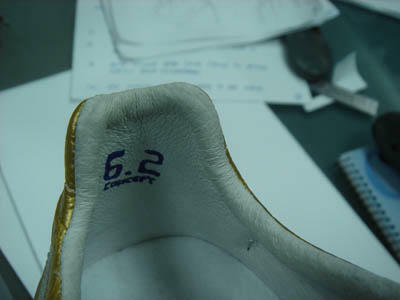 On the inside back collar lining (on the lig skin leather lining) a 6.2 Concept logo is added, to be screen printed in gold. 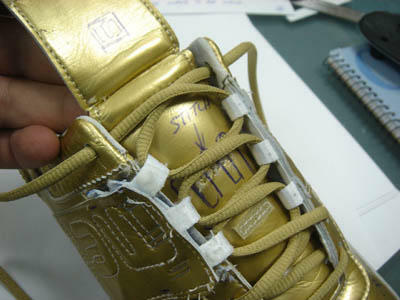 The biggest technical change to the pattern is the revision of the lacing system. 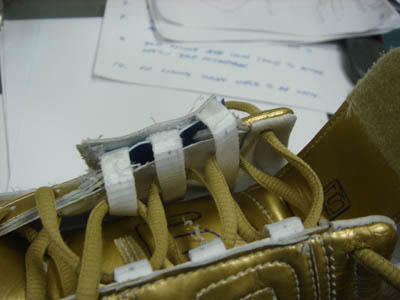 As shown in the photo, the quarter overlays are detached from the main quarter panel, and the webbing is attached to these parts. 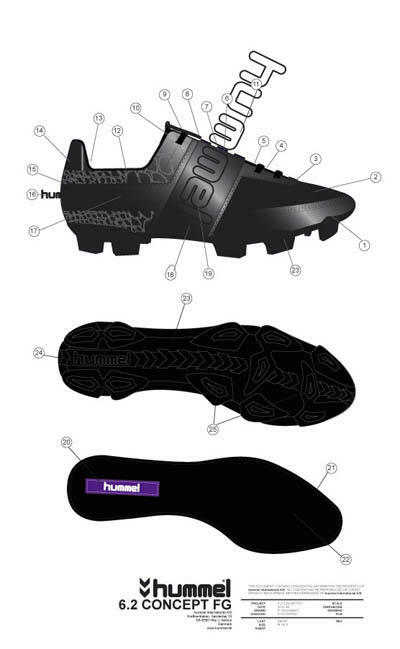 This special lacing system that uses webbing connection to the lasting bottom and quarter overlay flaps is designed to provide a snug cage-like fit inside the shoe, ensuring comfort and fit. 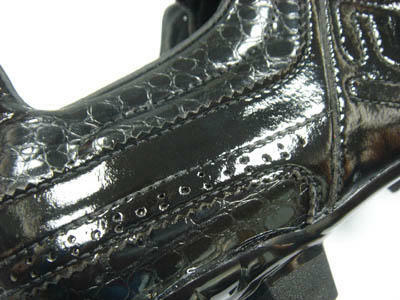 On the black colorway, the vamp material is changed from the flat looking SuperMicrofibre material to the same shiny croc emboss SuperMicrofibre used on the rear counter. 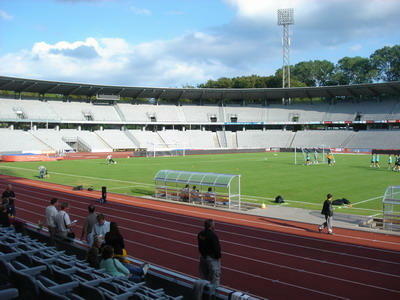 I attended an FC Barcelona training here in Aarhus at Atletion Stadium for a closed practice session yesterday (thanks to hummel-AGF connections!). In addition to watching a great practice, I had an opportunity to meet with FC Barcelona Asst. 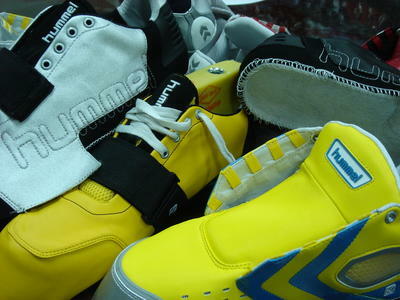 Trainer Henk Ten Cate, who has been wearing hummel for a long time. 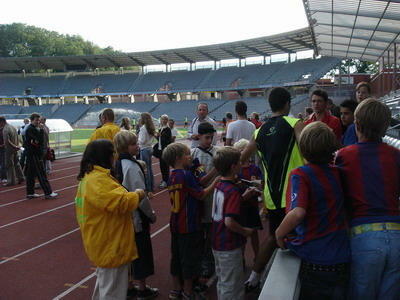 Stay tuned for FC Barcelona in Aarhus pics. 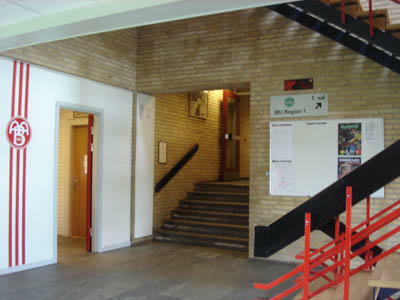 There is a freindly match this evening featuring AGF and players from Aarhus area teams. Monday is the big match vs. the AGF first squad. 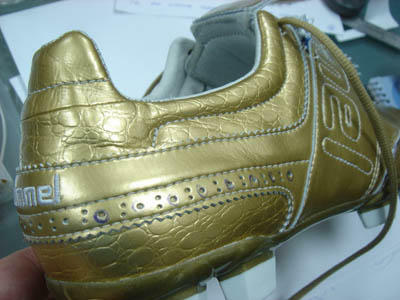 For more pics follow the Read More link below. Following the revision of the initial pattern during the review of the first pullover, the initial colroway specifications are created. Typically the specifications are done only at this time after the first corrections so that any modifications to pattern (ie. new parts, logos, etc.) 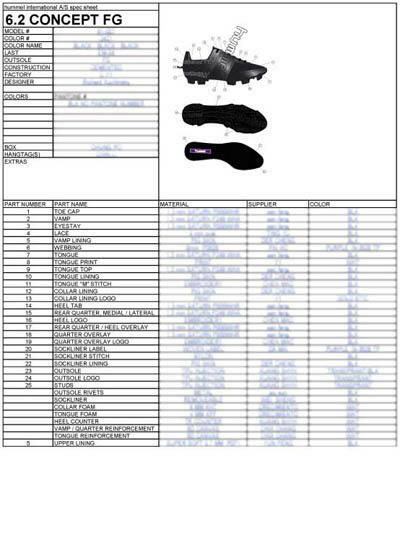 can be included in the specifications. 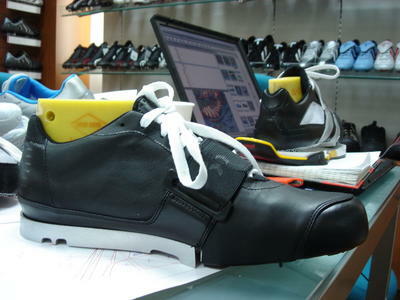 The first prototype sample made following the specifications is called the First Colorway Sample. Click Read More below for more pics and info on the specification process. 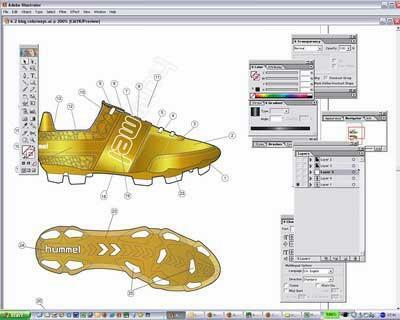 Specification drawings (colorways) are created in Adobe Illustrator, detailling all the parts, logos and details. 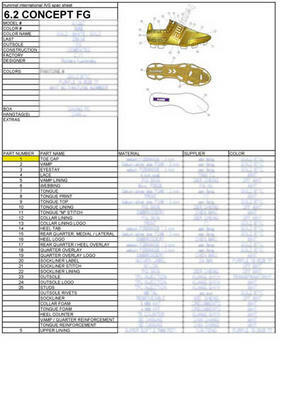 Each part is assigned a number so that detailed descriptions can be made in a specification sheet (see below). 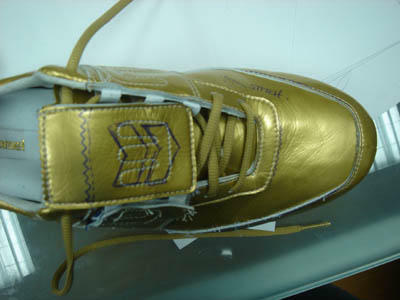 The first colorway selected for the 6.2 Concept FG is a Gold/white/Gold combo. This colorway takes full advantage of the innovative design and croc emboss material adding an exciting, highly visible aesthetic. This colorway was designed for the player who is 100% confident of their skills and their own personality and is looking for a way to express themselves on the field. 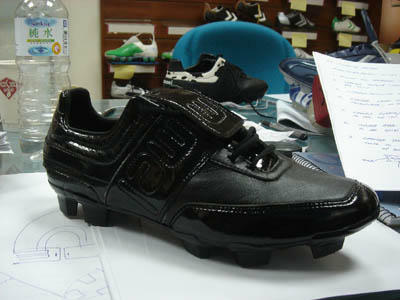 The second colorway, Black/Black/Black, takes a more refined and subtle approach to personal expression. The entire upper is all black, with contrasting shiny black SuperMicrofibre and and more matte, leather-like finish used on the vamp. 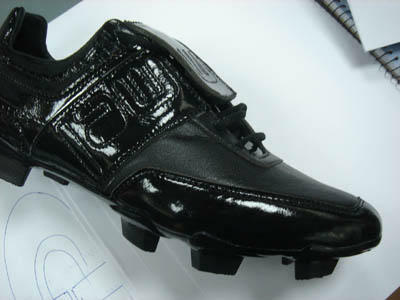 Inspired by shiny tuxedo and men's fashion shoes, this colorway mixes the contemporary with tradition. 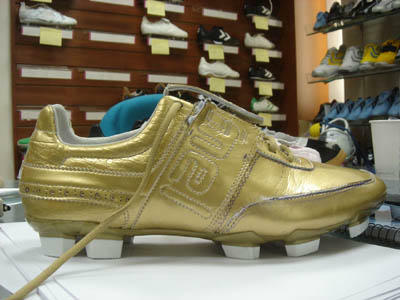 Refined in a classic dress shoe the overall approach is innovative for a football boot. Different than anything else on the field, this colorway is simultaneously subtle (all, black including the logos and studs) and screaming (shiny black croc!. The specification sheets for the selected colroways are created to list full detail for each part. The specification sheets list Pantone color, material, material detail (ie. thickness, supplier) and also addition hidden construction elements such as collar foam, reinforcement, stitching, etc. 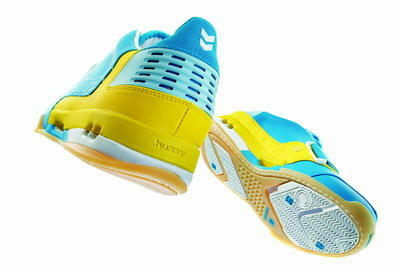 Some additional pics posted here of the new 4.2 Concept FGC Women's models. 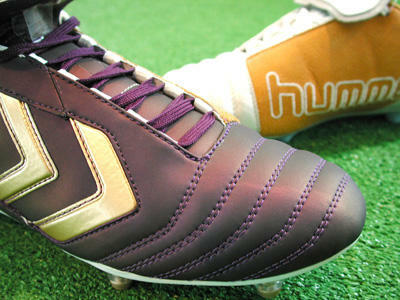 These boots are hummel's first Women's boots. Additional info to come later! 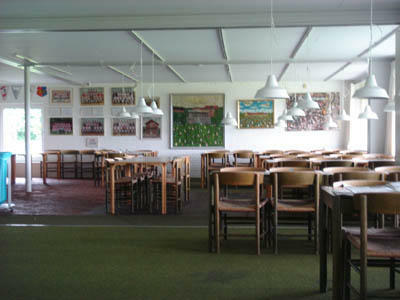 More pics after the Read More link.